Smite Organic DE Powder is a disinfectant powder and drying agent for use in poultry and livestock bedding and housing areas, especially moist areas and where moulds, fungi, mites and crawling insects thrive. Smite Organic DE Powder is an organic, naturally-mined, mineral product made up of fossilized remains of diatoms, a type of hard-shelled algae. It contains no pesticides or chemicals; it is a natural earth which is an environmentally friendly powder for poultry or livestock housing or bedding. Smite binds ammonia therefore reducing odours, it absorbs moisture and is a natural desiccant, keeping the environment clean, dry and sweet smelling. A dry environment prevents moulds and fungi and discourages infestation of mites and insects. 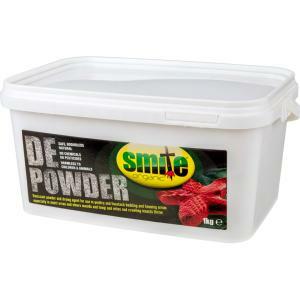 Smite Organic DE can also be used for dust baths, nest boxes and in the litter or bedding areas. Addition of Smite improves foot condition and contributes to the well being of the animal.